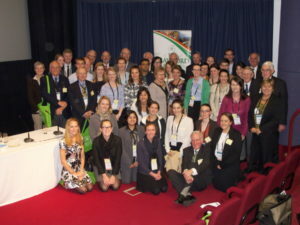 The WA Young Crawford Group, made up of students and early career scientists from Western Australia who received scholarships to attend the 2014 Crawford Fund Annual Parliamentary Conference, partnered with Scope Global to host a special event on Tuesday 5 February in Perth. The event was an opportunity to hear from volunteers who have returned from placements with Australian Volunteers for International Development (AVID), an Australian Government initiative. Volunteers shared the personal experiences about their placements, as well information about the agricultural research and international development projects in which they were involved. The WA information and networking evening is a prime example of how the Crawford Fund Conference Scholarship benefits its recipients, by providing an opportunity to establish professional and personal networks that persist beyond the conference. The Crawford Fund Conference Scholarship covers the cost of registration, travel and accommodation and is part of the Fund’s efforts to encourage young people in their study or careers in international agricultural research. It is offered to young Australian agricultural scientists with a genuine interest in international agricultural development. Our conference scholarships will again be offered for this year’s conference – information will be posted on our website, FB and Twitter accounts as the scholarships are available.